Its long been thought that the Media and Entertainment Industry is one of high barriers to entry for people outside an incestuous social clique. With the launch of every star son and daughter and with the reigns of every top producer being passed to son, this perception has grown and grown. 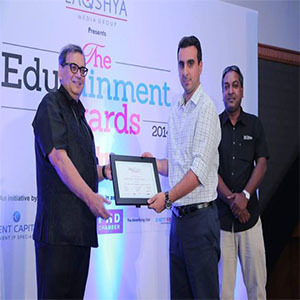 This fuelled the overwhelming feeling therefore, that education is not a perquisite for this business, especially education in the field of media and entertainment itself. I have always held that this is a rather sad way of looking at things. Even though doctors in this country generally give birth to doctors (at least it seems so! ), one simply wouldn’t say that there is hardly any point to send your child to train in that field if they wanted a career there, hoping that your ward would learn ‘on the job’ or that you could simply hand over your established practice to them without them graduating MBBS. I come from a family where both my parents were doctors but that doesn’t mean I shall be setting up a clinic somewhere and doling out advice because I have ‘seen my parents do it’. The word talent comes into play here a lot. The media industry is a place where perception says you need ‘talent’. So when we go to doctors to cure our bodies from disease or to architects to build us flats thirteen floors up in the sky, we don’t rely on them being ‘talented’? I don’t know about the readers, but give me a talented doctor over someone who clearly has no talent with a scalpel any day of the week. Hell, it should be a prerequisite! So if someone is talented with a scalpel, does that mean they can simply skip the five years of medical education? Can they start operating the minute they have demonstrated a steady hand and caring nature? No. He/she would need to study long and hard before perfecting their style and skills to make them an able surgeon. So why should it be any different for a filmmaker? We are happy with our dancers and musicians training for long hours, even packing them off to gurus for years to perfect moves, instruments and voices, yet filmmaking and entertainment is something that is only about ‘talent’, no practice or training needed. Can’t be right. Nowhere in the world would anyone allow someone to pilot a billion dollar jet without hours of training and years of education. Nowhere would someone be allowed to control a Fortune 500 company without experience and years of business school education. Yet we can give million dollar movies to people who simply have talent? And expect them to pay off? Seems a heck of a risk and one the industry can no longer afford. Clear to me that the wider Media and Entertainment Industry is beginning to come around to this fact. They are looking more and more for people with some education in this space and the setting up of the National Skills Development Council in India across sectors and including entertainment in those sectors is a step to formulate the necessary training skills needed for certain positions in the industry. Once that is ratified we can finally put this idea of talent alone being the driver of the entertainment industry forever. India’s entertainment industry needs more training and more up-skilling and there are reputed institutions providing this across many specializations. These students are in demand across industries because they are ready and able to meet the burgeoning demands of an industry which has woken up to the value of education and training. Missing out now would mean missing the boat completely. Rahul Puri born in Neath, UK a graduate of Kings College London, spent almost 3 years at UBS Warburg in London in corporate finance, working on international transactions worth up to US$10 billion. These included the merger of Public is with Saachi and Saachi and the IPO of Dentsu Advertising in Japan. After moving to Mumbai in 2002, he joined Ambit Corporate Finance and soon after Nimbus Communications. In 2003, he joined Mukta Arts Limited as Vice President - Finance and Strategy and has been involved in the development of the company and the production and release of numerous films. He is now the MD at Mukta Arts and Head-Academics, Whistling Woods International.